September is Hunger Action Month! Take action and join us for a TWO-DAY Dine Out event on September 2nd & 3rd at California Pizza Kitchen (Washingtonian Rio Center). Funds raised on those days will directly support all of HELP’s programs, including the pantry, infant needs, prescriptions and transportation. Please share the promotional flyer with family, friends and co-workers. 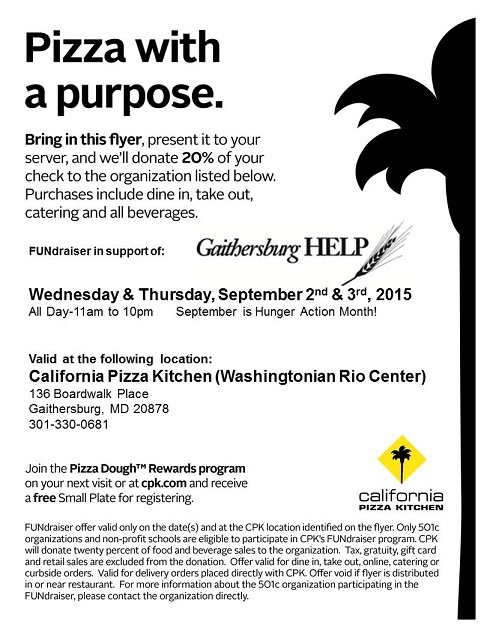 When placing your order for dine-in or takeout on Wednesday, September 2nd or Thursday, September 3rd, just show a copy of the flyer to your server and CPK will donate 20% of your bill to support Gaithersburg HELP!